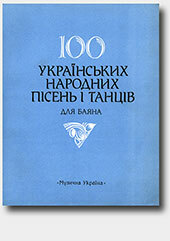 100 Ukrainian Folk Songs and Dances for Bayan (Accordion). Video demo: Ukrainian Folk Song "Ishly Voly iz Dibrovy" (*Oxes Were Coming From The Oak Woods). Arranged for bayan (accordion) by M.Rizol. Video demo: Ukrainian Folk Song "Ishov Kozak Potaykom" (*Cossack Was Going Secretly). Arranged for bayan (accordion) by M.Rizol. Video demo: Polka. Ukrainian Folk Dance. Arranged for bayan (accordion) by M.Rizol. Video demo: Ukrainian Folk Song "Oy u vyshnevomu sadochku" (*Oh in a cherry garden). Arranged for bayan (accordion) by M.Rizol.